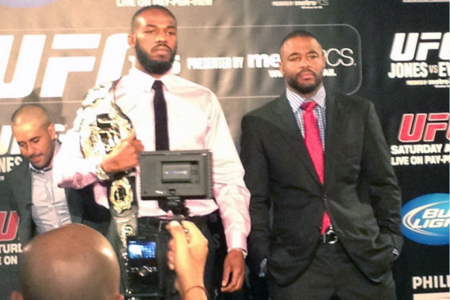 UFC 145: Jon Jones and Rashad Evans Beef Cooling Off? Are you tired of hearing the nonstop he-said-he-said banter between light heavyweights Jon Jones and Rashad Evans (Pictured)? Well, it seems the bitter rivals are as equally sick of talking about their ongoing beef. Although the friends-turned-foes have exchanged heated words over the past 13 months, it appears the animosity is starting to subside as UFC 145 draws closer. Many were expecting fireworks between the two during last Friday’s conference call, but no sparks were ignited. Then during Wednesday’s press conference, despite sitting face-to-face and just inches away from each other, not only were the insults lacking, but compliments were actually dished out. “I think it’s funny because the more you hear the story, the more we all go at it and talk about the coaches and try to figure out who is telling the truth, it’s almost therapeutic for everybody,” said Jones. “So I think this fight will be like the last counseling session for the whole situation. Evans wasn’t quite ready to rekindle their bromance, but he was prepared to put their history in his rearview mirror and focus on Saturday’s daunting task of dethroning the 5-to-1 odds-on favorite. “I had a year to kind of deal with the situation. I’ve made my peace in a lot of ways with the situation,” said Evans. “I’m not really that emotionally invested into it anymore. I just want to fight. While Jones didn’t send his former mentor any verbal messages during yesterday’s powwow, he may have done so with his eyes. In breaking tradition, Jones stared dead into his nemesis’ pupils during their face-off at the conclusion of the presser. “Bones” typically avoids eye contact by looking off to the side during the photo op. UFC 145 takes place inside Philips Arena in Atlanta, Georgia. The 205-pound title affair headlines the pay-per-view broadcast.